As an exporter, you focus on selling your goods and getting paid for those sales. How you structure those sales, and the payment option you choose, can help increase the liklihood of both. Whether the product being shipped is customized, built to specification, or is available off the shelf. The global economy is fluid; a firm will benefit from regularly examining their customer base and assessing political, credit and foreign-exchange risks to determine which payment term best suits the situation. There are organizations and government agencies that provide reliable information on the buyer's country. 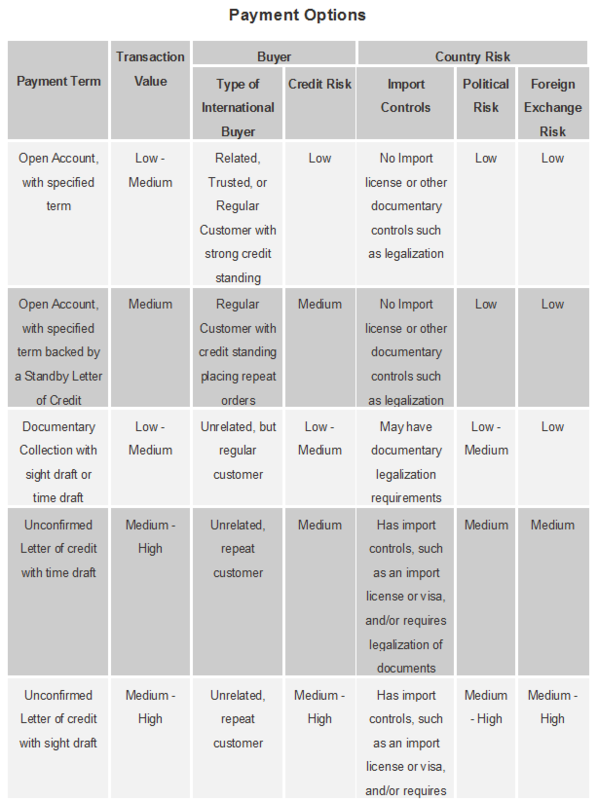 Evaluating Export Markets: How to Assess Country and Customer Risk. The U.S. State Department's A-Z List of Country Pages. It is important to understand the risk and exposure you will encounter. In some cases, the risks are readily apparent to the parties; in others, the risks are obscured by banking protocol in the buyer’s country or laws in the buyer’s country. As a result, it is important to conduct research and then be as explicit as possible in the offer or quotation, the contract, and any other payment-related document. Open Account qualified by the phrase "net 30-days from intenrational bill of lading date." Risk: Non-payment since the buyer has the goods prior to making payment. Benefit: Low-cost transaction for the seller and buyer. Costs: Limited to the wire transfer fee and foreign exchange costs. Open Account qualified by the phrase "net 30 days from international bill of lading date" backed by a Standby Letter of Credit. Risk: Buyer has goods prior to payment. There can be delay of reimbursement as payment occurs upon passage of time per the agreed terms and the submission of documentation required by the letter of credit. Benefit: Bank issues the Standby Letter of Credit, which will be subject to independent banking rules. The International Standby Practices (ISP) 98, Publication No. 590 or the UCP 600 also known as ICC Uniform Customs and Practice for Documentary Credits (UCP 600) issued by the International Chamber of Commerce when referenced in the letter of credit. Costs: There will be banking fees deducted from the payment; the buyer will pay banking fees and interest for the duration of the Standby Letter of Credit. Time Draft containing a statement identifying a date when the seller will be paid such as "30 Days from International Bill of Lading Date." This is also known as a documentary collection under a time draft. Risk: Buyer has goods prior to payment to the seller upon release of the documentation to the buyer by the buyer's bank. The seller must rely on the buyer to come forward with payment as per their agreement with the bank. Benefit: Buyer promises their bank that they will honor their commitment to make payment prior to receiving documentation, which allows them to claim the goods from the international carrier. Bankers handle drafts under a set rules known as URC 522 and titled, ICC Uniform Rules for Collections. Costs: Generally low; approximately $250 per transaction. Sight Draft containing a statement "at sight." This is also known as a documentary collection. Risk: Reliance on buyer to come forward with payment. Benefit: Buyer pays their bank prior to receiving documentation that allows them to claim the goods from the international carrier. Bankers handle drafts under rules issued by the International Chamber of Commerce known as URC 522 and titled, ICC Uniform Rules for Collections. Documentary Letters of Credit either Unconfirmed or Confirmed. Risk: High percentage of documents submitted to the bank in the seller’s and/or buyer’s country do not comply with the requirements of the letter of credit. This exposes the seller to the risk of non-payment. Benefit: Most risks are mitigated through bank promise of payment under the terms and conditions written into the letter of credit. Bankers handle letters of credit under rules issued by the International Chamber of Commerce known as UCP 600 and titled, ICC Uniform Customs and Practice for Documentary Credits (UCP 600). Costs: The fees are dependent on the value of the letter of credit; it is rare for a bank to adjust its letter of credit fees. The seller and/or the buyer may incur administrative fees. For example, a freight forwarder may charge letter of credit handling fees, or a seller may incur costs when process letters of credit in-house. Risk: Loss of orders to the competition who is willing to accept other forms of payment. Benefit: Payment prior to shipping the order. 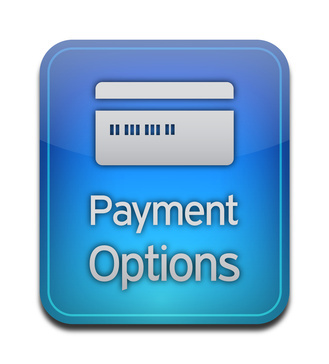 A combination of two or more of these payment options. The key is to choose the term that lets you sleep at night. Part of your assessment will be to review of the various payment options your firm offers your customer base. To assist you in a review of payment options, here is a table of payment terms associated with conditions that support use of the payment term. For example, if the risk factors in the buyer's country are minimal, the credit risk is low, the political risk is low, and the foreign exchange risk is low, then the open account may be the option to select. This post was originally published in November 2009 and has been updated to include current information, links and formatting.